Do you know where bourbon can be made? 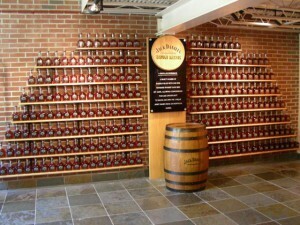 Do you know why Jack Daniel’s isn’t a bourbon and what the difference between bourbon and Tennessee whiskey is? If you’re not sure, then why not join me on a journey through Tennessee and Kentucky where I’ll be talking to the folks who make American whiskey and asking them to explain the different aspects of how it is made? I’m in Nashville, Tennessee, where it’s pouring with rain and we’re heading out to the George Dickel distillery and Jack Daniel’s to learn all about Tennessee whiskey, charcoal mellowing and the Lincoln County Process. Over the next week I’ll be visiting eight distilleries, including the newly opened Wild Turkey distillery, the new visitor facilities at Jim Beam, and the tourist offering of Bulleit in central Louisville. There will be time for a trip to a vast cooperage and to the Oscar Getz Museum in bourbon’s capital of Bardstown, where the whole history of this great American spirit can be discovered. American whiskey is in the grips of a revolution right now, with hundreds of new micro-distillers starting to produce spirit in recent months. One of the highlights of the trip will be a dinner featuring a number of craft distillers. And I’ll be reporting back on cocktail ideas, food matchings and the new wave of flavoured whiskeys which are bringing a whole new generation to the category. If you’re keen to know more, follow my blogs in the coming days.